A painting? Now that’s a cool gift! They should've said that if they wouldn't want those things, I'm thinking. The point is they didn't say anything about what they want, like, hate, use, etc. As long as you've got good taste art is fine with me. I was on my way to the post office and stopped by the mall to pick up a beverage when I saw something interesting I wanted to add. Now I've unpacked that package in favour of a bigger box so the new item would fit. I hope I've chosen things my Santees like. As a non-drinker with food allergies, I think the chocolate and booze doesn't sound like such a good idea. How do I know if I am spending/sending some that the recipient won't drop right into the trash? My goal is to find something new that the recipient will also think is neat. In order to do that, I need a little more info than the recipient's desire for a surprise. If they have food allergies, they can take the food to work or give it to a friend, neighbor or relative. I agree with your point, which I understood as well. I had a person last year and one this year that was like that. They gave me like three sentences. Now, I agree, everyone doesn't write a book nor find it easy to put their thoughts into words. But it's really hard sometimes to go on what people provide. After all, the instructions do say don't be shy- so why not go ahead and say what it is you like, what you're passionate about, what you hate etc? You never know what mentioning those things will do! And in Holland we have Chocolade Letters which is always fun to add! I just ordered a gift for my little guy from ThinkGeek. I hope they like it when they get it. It looks like I have the honor of posting the first arrival of the season! 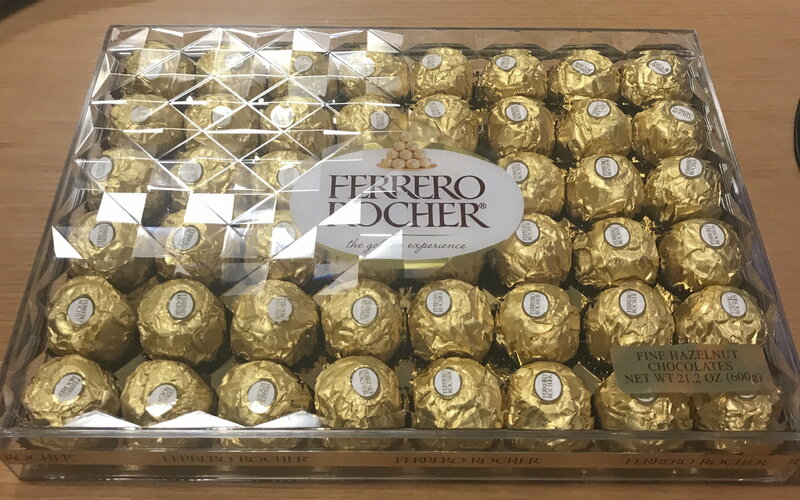 I received a nice package of Ferraro Rocher Chocolates in the mail today. YUM! Happy Shopping everyone! Oh and Kipper, I still can't believe after 7 years I've been doing this Wharvey still hasn't given me you!!!!!! I have 2 siblings who confine their shopping to what can be done by mouse, so I keep an Amazon wish list. Makes them happy, makes me happy. I never to expect to get everything on it, but I include it on my Secret Santa wish list so my Santas can get ideas. Maybe they'll use it, maybe they won't, but at least I've tried to make things easy for them. Got my assignments, gonna need some help. How soon does the Head Elf come on duty? Just saw upthread that HeadElf is enjoying his vacation. Will patiently chew my nails until he returns. Good thing my victim Santee is within driving distance. I was supposed to update Santa Wharvey on when I shipped my gifts out. Oops! Just sent! And I do realize that although I did write a lengthy bio, I probably didn't give my Santa very much to work with. If my Santa is reading this, feel free to reach out to the Head Elf to pass along any questions, and I'll gladly help! looks like my little guy will be getting his gift today. I hope they like it. UPS seems to be delivering on Saturday at no extra cost for the holidays.